What is black mold? It is sometimes called Stachybotrys Chartarum. It is a toxic mold. It is poisonous to humans. Reactions to black mold vary. To some people it is merely a health irritation. To other people it's a health hazard. It is a greenish black mold. It grows well in straw, hay, wet leaves, dry wall, sheet rock, carpet, wall paper, fiber board, ceiling tiles, and insulation. Basically, it can grow all over your house. It needs a damp place to grow. It survives and spreads best in areas with over 55% humidity. Anywhere with a water leak might have this mold. This is not the greenish black mold you see in the shower. 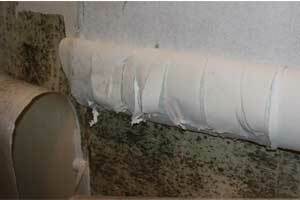 Bathroom are typically full of common mold, mildew. This is not that bad unless you are allergic to molds. Unfortunately, you can't tell the difference between toxic and non toxic mold by looking at it. To know for sure if you have black mold, you need to have it tested at a lab. Some labs offer a cheap test. You might experience these reactions to black mold. If you have mold in your house and you are experiencing any of these symptoms, you might have Black Mold. Read this article about the dangers of mold to find out how to prevent mold. If your symptoms persist, please go to see your doctor. Leave What is Black Mold Page and Return to Air Purifiers, Asthma, and Allergies Page. Leave What is Black Mold Page and Return to All About Air Purifiers Home Page.